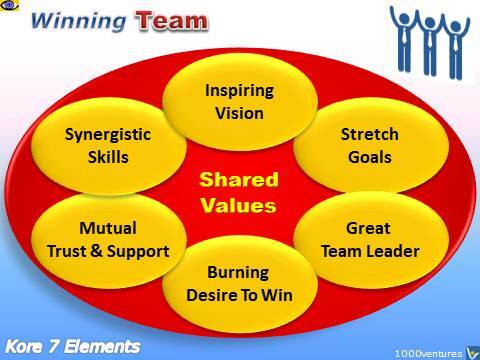 Here are ten key differentials to help you mould your people into a pro-active and productive team. In a group, members think they are grouped together for administrative purposes only. Individuals sometimes cross purpose with others. In a team, members recognise their independence and understand both personal and team goals are best accomplished with mutual support. Time is not wasted struggling over "Turf" or attempting personal gain at the expense of others. In a group, members tend to focus on themselves because they are not sufficiently involved in planning the unit's objectives. They approach their job simply as a hired hand. "Castle Building" is common. In a team, members feel a sense of ownership for their jobs and unit, because they are committed to → values-based common → goals that they helped establish. In a group, members are so cautious about what they say, that real understanding is not possible. Game playing may occur and communication traps be set to catch the unwary. In a team, members practice open and honest → communication. They make an effort to understand each other's point of view. In a group, members receive good training but are limited in applying it to the job by the manager or other group members. In a team, members are encouraged to continually develop skills and apply what they learn on the job. They → perceive they have the support of the team. In a group, members find themselves in conflict situations they do not know how to resolve. Their supervisor/leader may put off intervention until serious damage is done, i.e. a crisis situation. In a team, members realise conflict is a normal aspect of human interaction but they view such situations as an opportunity for new ideas and creativity. They work to resolve conflict quickly and constructively. (c) they are not working with the best people.